Cygnos360 Forum Member “antman1″ has posted a video of how he switches between his xbox live dash and a homebrew image using a Cygnos360 V2. A tutorial on how to do this will follow. It adds an “Erase” button to the “Program Flash” dialog, allowing you to erase your whole NAND-flash memory, while retaining your invalid block information. This may be useful to those who have problems storing data on their internal memory unit and who therefore want to “remove” it. After the NAND-flash has been completely erased, at least the “system” partition needs to be reprogrammed with the “Program Flash Memory” option. 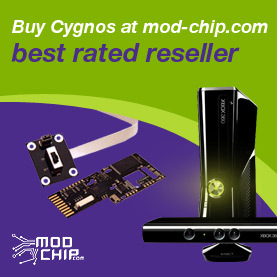 This video shows an installation of a Cygnos360 V2 into an Xbox 360 mainboard. The installation is very simple and can be done with a normal soldering iron with a small top. we have finally released our “big block NAND” version which we labled Revision F.
The new version does not carry a secondary NAND anymore so it is a single flasher, not a dual NAND. The reasons for this are, you don’t really need the dual NAND feature anymore on the home brew stuff and it allows us to make one version that fits all Xbox 360 versions. Cygnos 360 V2 is now available for Xenon, Opus, Falcon, Zephyr, as well as all different Jasper versions (16, 256 & 512). Our tests show very fast programming and reading times. Reading a full 512Mb image takes less than 10 minutes, a 16Mb image less than 2 minutes. The images created are highly reliable as we have implemented error checking during the transfer. The Cygnos360 V2 is faster, more reliable and easier to install than any alternative solutions. It is now in its 6th revision and we are proud to used each step to make it more perfect. Revision F is already on the way to some of our resellers which will stock them end of this week. Next week more stores are going to follow. “Certain” images floating around the internet make it necessary to patch the KV and SMC in order to run on Cygnos360 V2. This toolbox adds all the required functions to easily accomplish this task. The “Program Flash” dialog now allows you to specify a patched SMC and KV to inject into the image on the fly. A patched SMC can be created with the “Patch SMC” dialog, if the SMC from your original image is known to the toolbox. If this is not the case, there are pre-patched SMCs available “at the usual places”. Another dialog “Extract KV” has been added, which will simply dump the KV from your original image (Remember to use the “Patch SMC” and “Extract KV” dialogs only with original images, they won’t work otherwise). Please note, that this is beta software! It should only be tested by experienced users. Have fun with this new toolbox and please report any bugs! First of all, happy new year to everyone and welcome to 2010. Looks like it’s going to be a good year for Xbox 360 enthusiasts with all those neat applications coming in on almost a daily basis now. We have significantly increased the flashing speed for 16Mb xbox 360 NANDs. With the new firmware v1.03, programming takes 24 seconds and reading 28 seconds. That is a full image, not a partial! The new toolbox is also available which fixes small problems and makes flashing even more reliable. 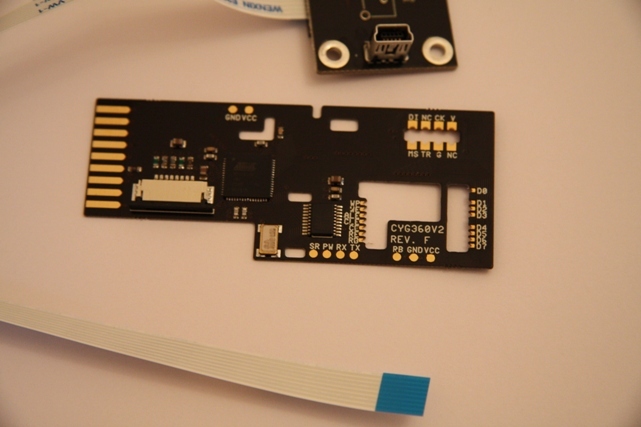 In addition to that, we have been able to get rid of the necessity to solder resistors or diodes to perform the JTAG hack which further simplifies installation, leaves less room to make mistakes and increases success rates of launching the exploit. Instead of the resistors or diodes, we are directly talking to the jtag port with appropriate voltages rather than with an approximate value. The installation manual has been updated to give you a better understanding about installing a Cygnos360 v2. Cygnos360 V2 for 16Mb NAND 360s is available in many countries around the world now with more shops and install-services coming in. (see http://www.cygnos360.com/resellers/ for the list. Many people are asking each day about “big block support”, meaning the Jasper versions with 256 and 512 Mb NAND flashes. We have this already running on prototypes in our lab and we are finalizing tests. We hope to release this before mid February. This will not be a firmware update but rather another hardware revision. Preliminary tests on the prototypes give us less than 10 minutes on dumping a full 512 Mb image and about 5 minutes for the 256Mb version. Programming, which is then a 64Mb partial flash takes merely 2 to 3 minutes. We will also introduce partial flashing possibility by then so that you can do certain “fixes” as well now using the Cygnos Toolbox. We are trying to push this revision out as soon as we can, but at the same time we will make sure it’s the quality you expect from us. Please have some more patience, it will be rewarded! So, happy modding to everybody! We are currently changing the Cygnos360 website to give you a better service. The firmware contains all the new features of the previous firmware 1.03 beta. Please refer to this thread for further details. In conjunction with toolbox v1.08 beta, the new firmware will greatly improve upon read and write performance. On our test system, programming a 16MB flash took 48 seconds with firmware 1.02. With the same firmware, reading took 55 seconds. Cygnos360 V2 was plugged in a cheap USB 2.0 hub for these test. With the new firmware v1.03 beta 2, programming takes 24 seconds and reading 28 seconds. Performance has been much worse in the past when Cygnos360 V2 was connected to a USB root hub. This situation has improved now up to a point, where it is only slightly slower. Your feedback is always welcome. Since we altered the timing of the NAND-flash reading and writing, regressions in this area may be possible. If you experience reading or writing errors you did not have previously, please report! Differences in read and write performance are also of interest. Enjoy! Here it comes. updated version of the manual with lots of input that came from the forum. thanks to all people who contribute with good feedback!